DIE KUNST IST TOT! DADA UBER ALLES! When I was going through my undergrad at UTK, I kept running across Romantic poetry. At the time, I couldn’t stand the stuff. It was dull, it lacked life, joy, a certain music that played in the background against the words. I can’t quite pin it down, but there was definitely something in there that I just couldn’t jive to. Every line would end and I’d feel my eyes unfocus. I’d start people watching without realizing I was doing it. At the end of the poem, I’d realize that I hadn’t read anything, and I’d have to go and do the whole damn thing again. And then, I discovered Dadaism. The absolute maddest thing on the face of the planet. Everything about it made me want to jump up and shout, “Yes!” like a character from a Jack Kerouac book. Of course, as tends to happen, we only read a couple of them and then went on to Samuel Beckett. (Which, for the record, I also got a rise out of.) But, in my opinion, there’s no real comparison. I wrote a flash fiction (micro-fiction?) piece about it. It’s untitled, but I’d have to call it “Dada” if nothing else. For more information about the best thing ever, check out the manifesto or, perhaps, another manifesto, this time on Surrealism. Seconds after beginning the readings for the next day’s class, Hannah’s nose began to bleed. “Odd,” she thought, plugging her nostrils with Kleenex, “that only happens when I read Victorian novels.” She looked at the poems (for only those of a certain insanity-driven mind can read poems) for another five minutes, then she began to feel dizzy. As she had been bleeding quite thoroughly for five minutes, Hannah assumed that this was normal, and as such, was not worried. A few minutes later, as she finished stanza seven of the poorly worded, vague heap of words in front of her, Hannah fell out of her chair, unconscious on the floor. She found herself in a realm of pure imagination, to lift choice words from Willy Wonka. Giant sheets of paper took the place of clouds in a vast, leather-bound sky. All around her, letters pranced and frolicked on grass that seemed to be paper. Extremely strong gusts of paragraphs, verses, and stanzas whizzed around her head at dizzying speeds. “Flee! Flee as fast as you can!” yelled a suddenly-appearing look-alike of Stephen King. Hannah blinked as vast companies of prose authors popped into existence, shrieked for their lives, and ran in a general Southish direction. That was when she first saw the Horde of Poets, the Vast Conglomeration of Vague-ocity, that Patrol of Pretension. They marched in rows, seemingly infinite. At their heads were the “greats” of every era which had been forced down Hannah’s throat. Off the bat, Hannah could see Wordsworth, Coleridge, and Robert Browning. Hannah’s knees buckled as the army marched forward, spouting out poems that strangled a passing herd of Joy. Joy dead in front of Hannah, she began to weep. Flocks of Hope, families of Reason became casualties as the massive force continued onward. Just as all hope seemed to be dead and Hannah doomed to live a life of ever-present analyzation, doomed to live in Vague instead of Vogue, a force of Dadaists arrived to save the day. Instead of greeting Hannah, the lead one, a Frenchman in a top-hat and NASCAR wife-beater threw a banana in her face and laughed. This confused Hannah, but as she was being horribly affected by the powers of the Poet, she couldn’t do anything about it. So it was that the massive force of Dada and the massive force of Poets met in battle. Bicycles, bananas, human waste, and off-colored paint flew from the Dadaists; verse and vague from the Poets. The Battle of the Muse took place over five hours, with losses from both sides equaling zero. As the fifth hour hit, both sides decided that they’d both had a long and trying fight. 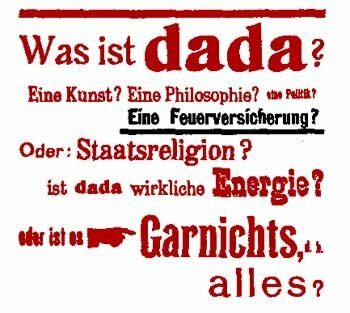 With a great speech filled with nonsense, the Dadaists persuaded the Poets to return the land to the prose writers, and the Dadaists returned to Paris to raid the Louvre. Some say that the Battle of the Muse didn’t take place inside Hannah’s dreams, but rather in the dreams of the Muse, and that Hannah wasn’t there, but simply dreamt it. Academics world-wide came to Hannah’s dorm room for weeks afterwards, forcing her to look at poetry in the hope that, in doing so, she’d replicate the dream, which in turn had the effect of causing Hannah to realize that she didn’t particularly like poetry or academics. So, naturally, she dropped out of college, bought several top hats, and moved to Paris to join up with a group of Dadaists who didn’t exist.